One of four children of Asia Minor refugee parents, Rena was born in Crete.Family problems forced the youngsters to finish growing up in an orphange there. After a sad childhood, Rena was re-united with her mother in Piraeus before WW2. Her troubles were far from over, however. Finding it difficult to live with her mother, Rena was sent out to earn her living as a servant.She was lucky enough to end up working for a well-know popular singer in the 1940's, who realised that this beautiful young woman was gifted with a lovely voice. An audition with composer Stelios Chryssinis was arranged. He spoke to Yorgos Mitsakis about her and, after a few rehearsals, Rena made her first recordings on 78 r.p.m.singing his songs "Semiha" and "Fthohokoritso" [Columbia 6792]. Rena was soon paired as a singing partner with Prodromos Tsaousakis, the most popular and highest paid singer of the rebetiko style from the end of WW2 until the mid-1950's, when Stelios Kazantzidis came on the scene.By this time, she was one of EMI's leading Greek artistes. In 1954 she began touring the world, singing for diaspora communities from Constantinople to New York.She eventually married and settled in London, continuing to sing in the Greek nightspots there. Of all the surviving women veterans of her generation of rebetisses, Rena Stamou stands out as the most youthful and lively. 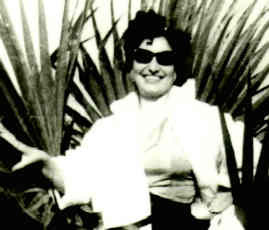 The 'revival' of the rebetiko that began slowly during the junta years really took off after 1974, and Rena became a sought-after 'original' exponent of the style.Well-known once again to afficianados of the rebetiko, in recent years Rena has made several recordings for the outstanding young bouzouki player and composer Vangelis Korakakis [on 'Bouzouktzides me Pixides', Lyra lp 4619]. She continues her public appearances in Athenian nightspots and frequently participates in live radio and TV broadcasts in Greece. Rena also sings from time to time in London with local rebetiko groups and claims a loyal following of young fans.